*Pre-sale package includes unlimited tastings of all competing beers, voting token and a signature glass to take home. 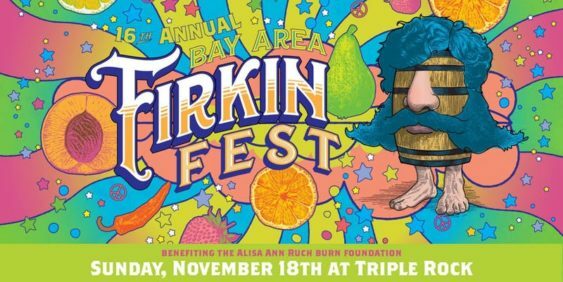 Prepare your tastebuds, the 16th Annual Bay Area Firkin Fest is happening November 18th from 11:30 am-4 pm. It’s been a decade and a half of ridiculously awesome cask-conditioned beer and just like last year, we’re celebrating absurdity. Over 20 of the favorite breweries to show every one what they think the “state of the firkin” is. They’re crafting the most outlandish, original and thoroughly “Berkeley” beers they possible can, and you get to judge their work. These brews have never seen the light of day before, and probably never will again. Proceeds of this event benefit the Alisa Ann Ruch Burn Foundation, a cause that needs support now more than ever. Drink for a good cause and educate yourself on how you can help the victims of fires. Must be 21+ to drink, families with well-behaved children are welcome. Your pets are loved but please leave them at home.